Daylilies are called daylilies because each flower is said to last only a day. 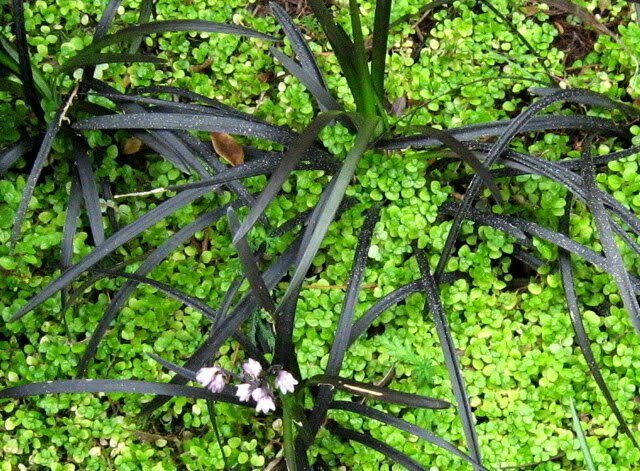 Although the flowers look like true lilies (Lillium sp. 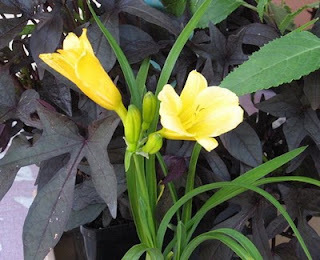 ), daylilies are in the Hemerocallis family. 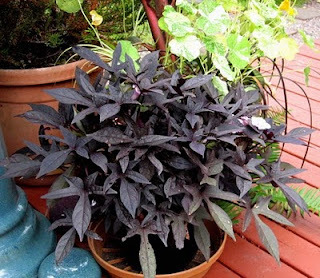 If you have trouble telling them apart, simply look at the stems and leaves. 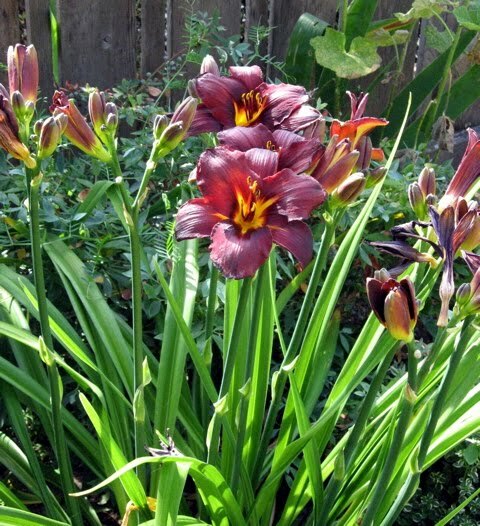 Daylilies have long, strap-like leaves, with flowers borne on long, leafless stems. True lilies are bulbs with a single long stem. 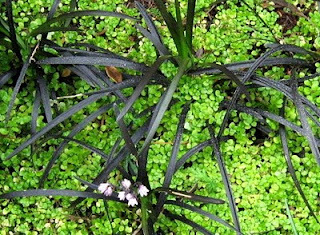 True lilies have leaves along the stem. Daylilies come in many colors and sizes and are among the hardiest of perennials. They aren't terribly fussy about soil, but, of course, will do best in beds with good drainage that have been amended with organic material. Water during dry spells. In the northwest, plant or divide daylilies in early spring or fall. 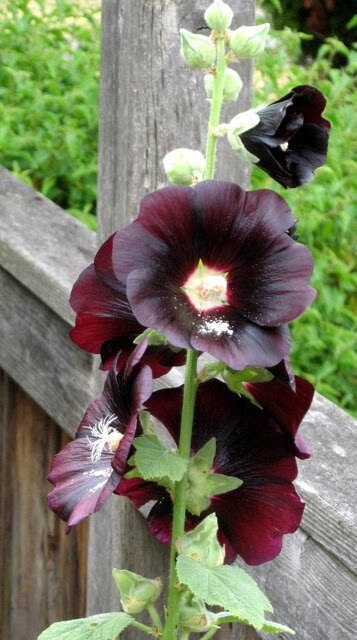 Clumps will spread over time and for best bloom should be divided every few years. 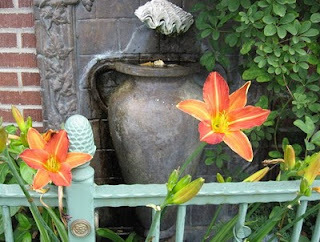 For more information on daylilies, take a look at Diana Grenfell's book "Daylilies," part of the Gardeners Guide series. Seattle is a city built on hills. Our houses are arranged on these hills like a patchwork of theater seats, taking advantage of the remarkable views our part of the world has to offer. Of course, keeping all of these sloping properties from sliding to the bottom of their respective hills is a challenge. 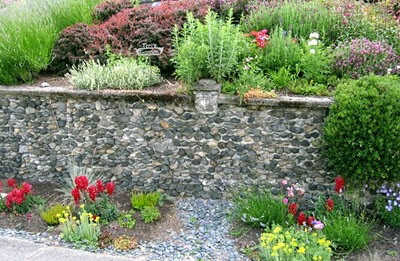 And rising to this challenge are thousands of retaining walls and rockeries. 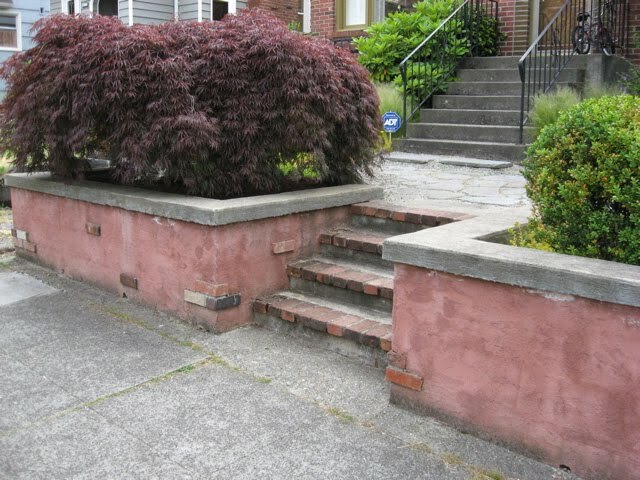 If you have a sloping property and need to build a retaining structure, Seattle is the place to explore for ideas. Here are a few of them. For people who complain that concrete is too boring, this is a clever way to use the material. These walls form the front edge of a yard with a red brick house. The homeowners could have chosen masonry to match the house, but masonry walls would probably have been more expensive than these tinted concrete ones. A few bricks attached to the walls echo the brick of the house, making for a cohesive hardscape design. Here is a concrete wall system that is clean and sophisticated. Finished with parallel grooves along the top and featuring built-in lighting for the steps (note the small rectangles along the wall), this is one of my favorites. 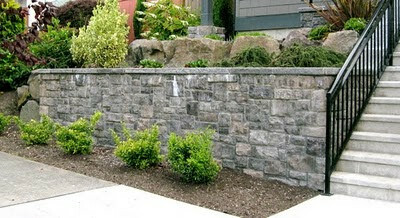 This type of wall, made of river rock, was popular in the Craftsman era. I doubt anyone builds walls like these much anymore. This one is in better shape than most I've seen and the plantings add to its charm. 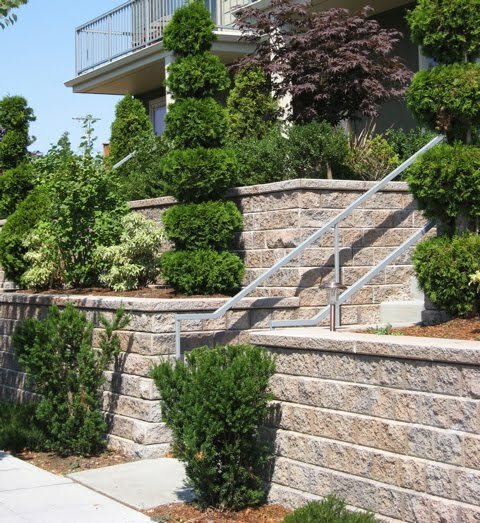 Today concrete walls with a stone veneer, like this one, are more popular. These can be constructed more quickly, easily and affordably than walls built with stone only. 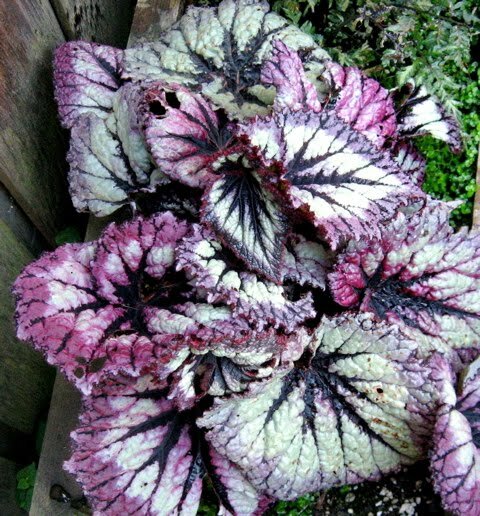 My landscape design instructor used to say, "The trouble with common plants is that they are used commonly." The same can be said of common building materials, like this concrete block. I know that these block systems are affordable and relatively easy to install. But aesthetically, they don't do much for me. Here, however, is a winning combination of planting and hardscape. The block walls literally set a stage for the plant material, which is what draws the eye. Note also that instead of one very tall wall, there are two tiers, one set back from the first. From a design standpoint, this is good because it adds layers of color and texture instead of a monolithic and forbidding looking structure. From a legal standpoint, the design works, too. According to the building code in Seattle, any structure over 4 feet tall is considered a retaining wall and a permit is required before it is built. 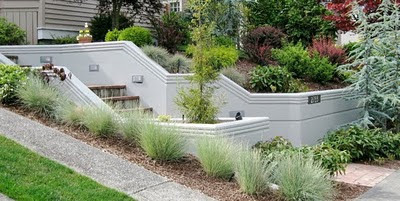 These tiered walls are each at or under 4 feet, thus avoiding the need for a permit. 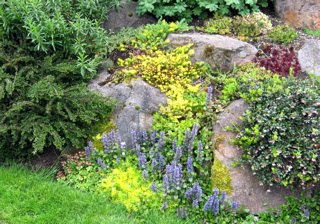 Of course, no article on garden walls in this area would be complete without a mention of the classic Seattle rockery. Usually made of basalt, which is abundant in the Northwest, these walls are constructed without mortar. 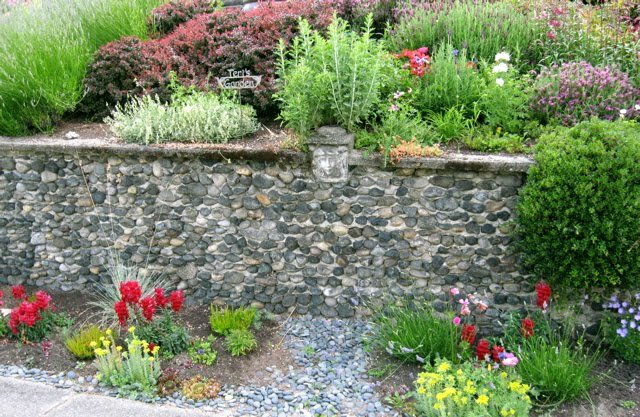 The gaps between the stones are perfect planting pockets for gardeners to fill with color, as you see below.